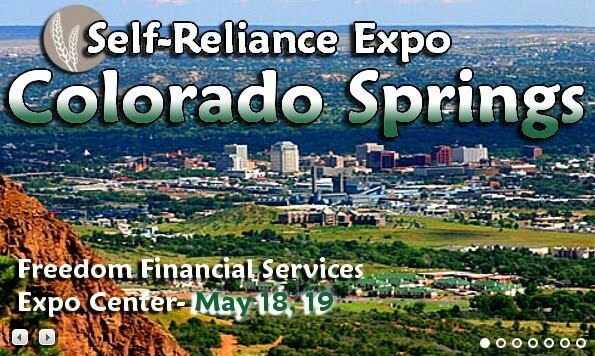 Rural Revolution: Speaking at the Self-Reliance Expo!! Who's in or near Colorado Springs? If you're in the vicinity, I'd love to meet you! 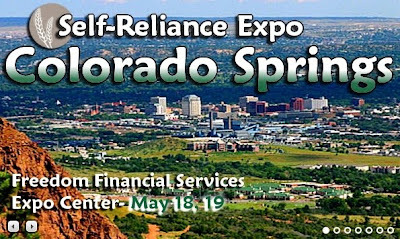 I've been invited to speak at the Self-Reliance Expo held next weekend (May 18-19) in Colorado Springs, CO. I'll be part of a panel called "The Women of Prepping" consisting of myself, Lisa Bedford, Jackie Clay, Kellene Bishop, and Nurse Amy. Look at the Preparedness industry (or any of its sister genres, Survivalism, homesteading, back-to basics, pioneer living, etc) either today or in the past and you will find it filled with men leading the charge to our salvation. However, it is the women keeping traditions alive. They provide the stability to this industry’s foundation and pave the way to the future by teaching their skills to others and forging new ways to keep us Self-Reliant. These are “The Women of Prepping”! At the panel discussion (which will be on Saturday 11am - 1 pm MT), we'll all be discussing our various specialties. Jackie Clay will speak on canning and gardening, Kellene Bishop will discuss self-defence, Amy Alton will focus on medical issues, Lisa Bedford will highlight finances, and I'll be talking about homeschooling and home businesses. Clearly there's a lot of cross-over knowledge among us, but these are the specialties on which we've been asked to focus. This is not only an opportunity for you to meet these great women in person, but you will have the ability to help shape the direction of the panel discussions. We will be accepting your questions from May 7th – May 14th for these women via email. If your question is selected for the panel, not only will you be participating in helping other learn, but also you will receive a Berkey Sports bottle signed by all the women of prepping. If your question is selected and read for the panel you will be contact via email to get your address for mailing your Berkey Sport bottle. So if you have particular questions concerning homeschooling or a home business you'd like me to address, by all means submit it to the email address above! I was also offered a chance to give another (solo) discussion with a topic of my choice, and so on both Friday and Saturday I'll be discussing country living in a talk entitled "Going Country -- Moving Rural for Self-Reliance." My talks will be on Friday 2-2:45 pm, and Saturday 4-4:45 pm. I'm tremendously honored to be attending this function and look forward to meeting some of the luminaries in the industry whom I've admired for years. I'm also hoping to meet some of you! How exciting!! Congrats to you. Wish we lived in the area I would so be there!!!! This is kind of off the subject of this post, but could you or any of your readers recommend any particular brand of manual grain grinder. I would like to buy one without a big investment and I find conflicting reviews of the grinders I have looked at. I would like to stay under $40.00, and get one that will grind coarse or fine. patrice..i sure would like to know about a good manual inexpensive grain grinder too. i dont use ground grains often, therefore do not want to sink a lot of money into one but i also want one that will last a long time. i wish i lived closer to colorado.. I'm afraid I have no experience whatever with lower-cost grain grinders, so I can't recommend one brand after another. I just typed in "grain grinders" on Amazon (http://www.amazon.com/s/ref=nb_sb_noss?url=search-alias%3Daps&field-keywords=grain+grinders) and came up with a number of models in the $40 range, but I can't vouch for any of them. My initial thought is, you get what you pay for. But I don't have a problem with lower-cost items if you don't plan to depend on them in survival situations. Whatever model you use, please let us know how well you like it! In my experience the smaller, inexpensive grain mills are simply not designed to last. Preparedness Pantry sells a small, inexpensive hand-crank mill that works very well and is a good value that I would recommend for anyone just experimenting or who only needs to grind small amounts of grain. For anyone planning consistent or heavy use, however, it is worth every penny to invest in a serious mill that will hold up. We saved up to buy a Country Living Grain Mill with a fly wheel and it is one of the best investments we've ever made. Hope this helps someone! I have 2 non-electric grain grinders. One is a low cost (made in China) copy of the old Corona mill that we had 50 years ago. It is a Universal 500. It works well on wheat and corn so long as you don't need a fine flour for light breads. It works fine for cracked wheat for porridge and corn for corn meal. I also have a Country Living Mill that also works great and can make a fine flour IF you are willing to spend the time and energy to do so. Generally I settle for a slightly courser grind(less work and time)that make great pancakes and Bannock Bread (aka Fry Bread). I mounted it on a home built table that allows me to sit and operate the grinder with my legs like a recumbant bicycle or stand up to gring using arm power. I sure do wish we had something like that Expo where I live! So many questions to ask, especially for us older folks. Good luck and have fun - I bet it's gonna be crowded! The real question is will there be a Ladies of Prepping calendar? Ps. My wife made me do this. Giggle. I want one too. Congratulations! CO is a long way from GA, but would love to meet you, Lisa and Jackie! (Not familair with the other 2 ladies, but I'm sure they are top notch too)! Have fun! Oh my goodness! How exciting! I live about 20 minutes west of Colorado Springs. I am so going to come hear you speak! Wow Patrice, that's exciting! You're going to have so much fun! I wish I could be there. Congratulations!